Register Log In Vannin' Community and Forums Forums Generic How To ..... What year/make/model has the most leg room for the front passenger? Like the title says, what year, make, and model of van has the most leg room for the front passenger? My 89 E-150 doesn't really have enough room for my passenger to sit comfortably, so I am trying to find out if there is any van that has more room. You may consider repositioning the passenger seat BACK 4 - 6 inches. I have done that with mine. I have an 84 E350 that started life with a 6.9l Diesel. On the Diesels there is even less room than with a gas engine on the passenger side. I have thought about that, but the side barn door opening is already too small to let rear passengers enter comfortably. I already know that next year I will be getting a newer van, so I am going to be looking at 92-up Fords that have the larger forward side barn door or maybe a slider. I need to have good access to the mid-ship seating as well as as much leg room as possible for a front passenger. Do Chevies/GMCs have more fornt pasenger side room than Fords? Dodges are out because the driver's door is awkward and there isn't enough foot room for me as the driver. What yr did they cut the middle N add 1.5 ft all the way back to make them wider? 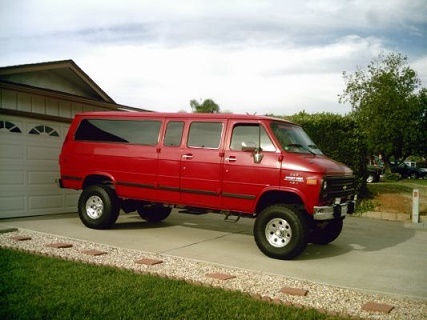 I also have a 93 Chevy G20 Sport Van, there is less room in that one than my Ford. I do have a sliding door, that I am converting to a Suicide Door and also moved the second row captains chair back 4 inches, so there isn't a narrow entry due to the front seat being back. The reason for the Suicide Door is I have created a monster and changed the rear axle from a Dana 61 to a Spicer S135 from a 2 ton Chevy truck. It is now a Dually and even with a Slider Extension it would not open very far. I am about to get back on it after moving to Idaho from Colorado. The reason for the S135 is it is Powered by an International DTA466 and a 10 Speed Roadranger. Huh? Do you mean what year did they change the side doors from 50/50 to 60/40? For Fords, that was 92. Dodge never did. I don't know when Chevy switched to the 60/40 setup, but I would guess late 80s or early 90s. Or are you talking about the aftermarket "wide body" conversions? I have seen mostly Dodges but some Fords and Chevies done like that. I have seen that done to vans from the 70s through the 90s. They are hard to find and were usually ambulances. Stuffed- that thing is a beast! I think the 3rd gen Fords had the most passenger leg room. I like the flat floors in our old Ford. Having installed visors and used windshield covers over the years on different brands I can say the Ford bodies were a lot wider anyway. A 3rd gen Ford WS cover is way to big for the same year Chevy. Although the Ford drivetrain is offset to the right a little more than the Chevy/GM there is still more room there. Stuffed that is a great looking van so far! Can't wait to see it finished. We have a long time member on here called Bonehead who has a 7.3 turbo diesel in a 3rd gen Ford with dually rear. I believe, if my old memory is right, that it was a body swap onto a dually frame....... I'll have to look him up under the members list and check his posts to see if the pics are still there. He hasn't been on here in many moons. Last edited by CatFish; September 23rd 2018 1:29 pm. Catfish- by 3rd gen do you mean 75-91 or 92-2014? If the 92-14 has the same or less legroom than the 75-91, I might rethink my plans to replace my van. I was referring to 75-91 as 3rd gen, what we used to call "late" Fords. I mistakenly thought that you were limiting your search to those years. My experience with the '92 and later Fords is that they have quite a bit more passenger room. We've had many later model E250 company service vans and the guys always liked them better (than the GM's) because of slightly more room between the seats for work consoles and more room in general up front. The handicap van converters always seemed to prefer 'em too. Oh, OK. Yeah, I love my 89 Ford, but it just isn't serving my needs anymore. I really need something with more interior room for the passenger and that is easier to get in an out of. A tall high top would be a big plus. I guess I will have to go check out some 92-up Fords and keep my eyes open for a good deal on one.